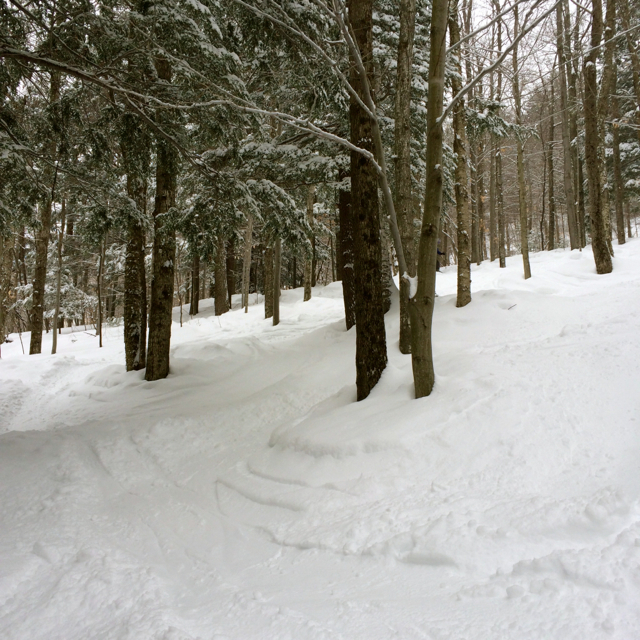 The two anecdotes in this post come from a ski weekend at Magic Mountain in southern Vermont. I’m sharing them because in general the weekend was wonderful. We stayed in a comfortable lodge at the base of the mountain; it snowed so much that we were there for a few unexpected extra days; the conditions were stellar and we enjoyed dozens of amazing runs in and among glades of pine trees; and I sampled a maple bourbon that was one of my favorite beverages I’ve ever consumed. But it was also a weekend that brought some of those trials we as traveling parents dread. And yet, somehow, these events only reinforced why traveling with children is a pleasure and a privilege – and that we as parents have everything we need to care for our children with us no matter where we are. For an instant, I could feel the warmth of the polyester bedspread pulled over my body, my soft pajamas, my husband Matt’s hand and breath on my back. The dream I had been fully immersed in vanished. In that first split second my body resisted the inevitable, pulled closer that slippery coverlet not my own – I would never sleep under such a thing at home – denied I had heard anything. My nine-year-old son Teddy’s voice is high and sweet but it had no place in the comfort of that strange bed in the deep darkness of a snowy night. The next sound emerging from Teddy’s mouth was unmistakable, liquid, violent. How is it that although he stood ten feet away from where I slept, I was immediately at his side in the small hallway outside the bathroom? 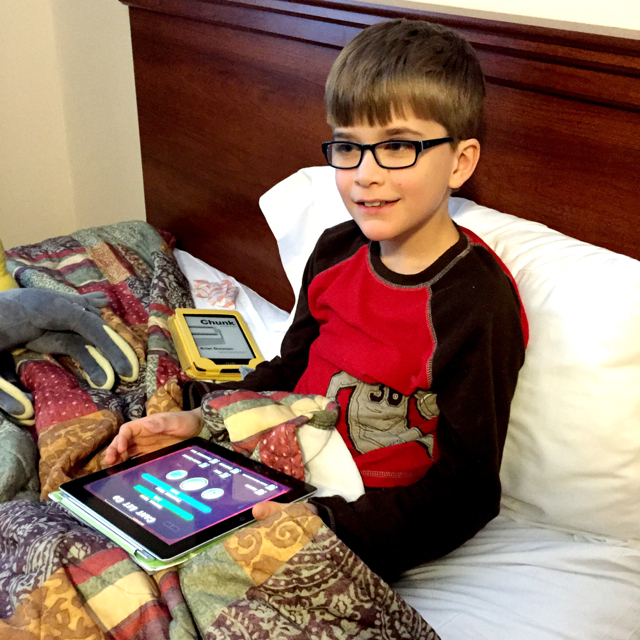 He had climbed down from the bunk bed in the adjoining room of our suite without waking his brother. Now there was cold white light encircling me, Matt, and Teddy. I guided his shuddering frame to the toilet, where he had finished, for the moment, the grim task his body had set him. The air was sour but somehow in that mother way I was not repulsed and all I wanted was his head in my lap. I sat down. The edge of the tub felt cool and hard. Matt swabbed at the mess in the hallway like a medieval servant using the only tools available: A small plastic garbage can that thankfully was lined with a bag, a rough white facecloth, and water. We discovered that that Teddy had coated the bathroom door and wall in addition to the floor and so he cleaned them too. What a tableau we made. The harsh light surrounded us in the darkest, deepest part of a winter night. A vacation ruined, perhaps, but at that moment it only seemed sacred. It was a suspended moment, a child’s small body needing comfort, the adults present on the scene bent over him and over the task of purifying and offering solace as best we could. How much gratitude do I have for my husband who somehow, miraculously, cleaned well enough that the room didn’t smell? He climbed into one of the double beds in our room with Teddy holding yet another small garbage pail while I crawled back into the other and dozed in between rounds of miserable retching that lasted for the next four hours. Again and again I climbed out of bed for cool damp cloths to wipe Teddy’s face and then returned to my unyielding hotel pillow listening to the beeping in the ski area parking lot as the plow trucks backed up over and over. It was thus I knew despite the closed curtains that it continued to snow and that we were not, in fact, the only humans awake on the planet. We wouldn’t be able to leave the next day because of the storm, and I knew this. Teddy would have to stay in the hotel room, resting, with Matt at his side. I knew this too. But I wasn’t really thinking ahead as I might have done at home. Instead I took comfort in our proximity, our shared breathing, the fact that we were all together in one small room, a family. Twelve-year-old Tommy, usually so confident and eager to plunge ahead had a whiff of uncertainty in his voice. We were standing near the summit of the mountain looking down a steep face that was covered with trees. A single track led into the thick glade. 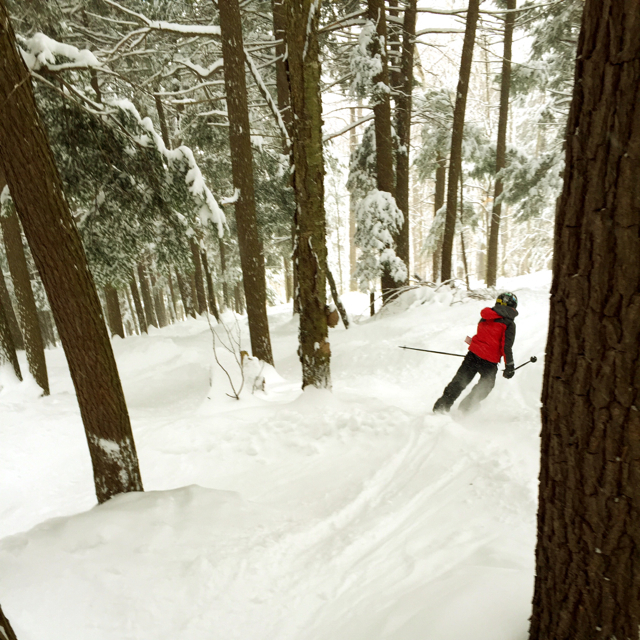 We had been skiing the trees almost exclusively since arriving at Magic two days before. The mountain has a diverse range of gladed trails, some of them steeper and denser than others. This was by far the most precarious plunge into the woods we had seen and I wasn’t totally sure that either of us had the skills for it. But I also knew from the map that this wasn’t a long glade and I reasoned from what I knew of the mountain that it was likely to only be steep at the top. Here was a learning opportunity, I thought. How often did Tommy ask to ski something and get frustrated when I told him no? How often did he think of me as the oppressive grownup force who kept him from skiing everything he wanted and was sure he could handle? I was tired of always being the heavy, and since Magic wasn’t a super steep mountain, this seemed like a reasonable way to show him the boundaries of his skiing ability. “If you want to, honey, I’m game.” I waited for Tommy to make up his mind. He hesitated, briefly, and then committed, his body disappearing faster than I liked. As I followed him I realized almost immediately that we had made a mistake. There was only one way to negotiate the narrow trail and that was straight down and over an ice face. With no pride to lose, I sat down and edged my way cautiously, my skis perpendicular to the trail, pushing powder ahead of me. And there was that word again. I couldn’t see Tommy, for he had rounded a 90-degree corner just below me. How to reach him quickly but safely? I was concerned that if I let myself swoop around the turn I would run into his back, possibly pushing him down the hill or into a tree. I willed my thighs to pull me upright while simultaneously resisting the pull of gravity down the hill. Somehow, my legs burning in protest, I managed to swing around and ski to where he was stuck, his legs splayed awkwardly off the trail, one ski caught in a branch. Once I was there offering moral support, he was actually able to extract himself without even removing his ski, but I saw an unfamiliar cloud move across his face. Fear. We stood for a moment, precariously balanced against the side of the mountain and looking down. The trail opened up – a bit – but the trees were still pretty close together and I wouldn’t have called it a gentle slope. Then I held my breath and watched as he used all the skills I had just reminded him of to negotiate his way. 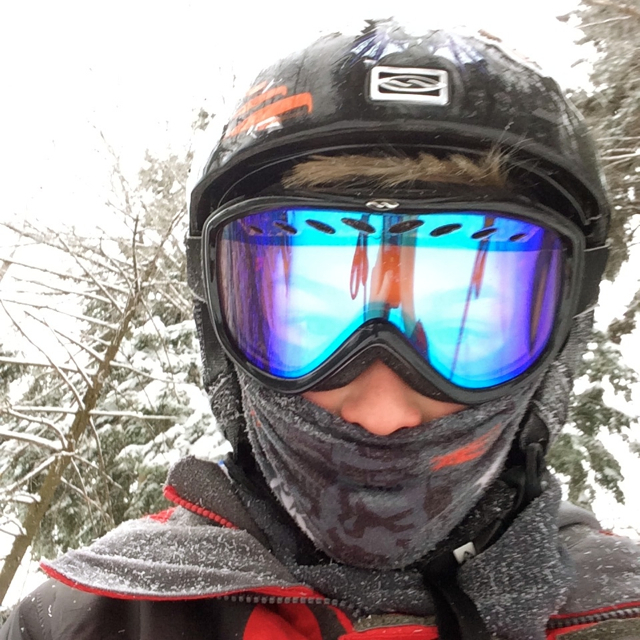 And so we skied into a less challenging forest, whooping and spraying snow as we went. Someday this boy will travel and ski on his own. His skills will surpass mine and who knows where he’ll end up – perhaps on a Swiss glacier that makes this mountain look puny by comparison. But until that happens, he’s right. He’ll be OK because Mom will be there by his side. I’m so lucky I get to travel with my kids. Interested in reading more about our trip to Magic Mountain? How eloquently you captured these two moments Mara….that many of us can relate to, all too well. A really good read, magic mountain looks lovely, thanks for sharing your experience, I think I will look to take the kids here. Any plans to go back again? Where is the next trip going to take you, and will there be snow? Thanks for the share! I am impressed by all the snow. I live in Bend, Oregon and we didn’t get that snow fall! Oh my Goodness! I hope these events didn’t ruin your trip. 5 days ago by motherofalltrips My lilac bush hasn’t bloomed in years, but last fall I had the tree over it trimmed. They smell as beautiful as they look, just in time for Easter brunch.